No, it’s not Christmas. But it is the time of year when we at Mak begin to order tons of new magic. Granted, we order magic all year long, but it’s now when we place our orders for the things you will be needing and wanting for the holiday sales season. Keep checking the web and keep downloading the product database to get a handle on what we have that’s new and popular. 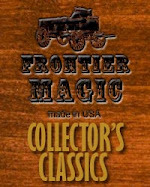 Lots of new items are arriving here at MAK everyday from Magic Tao, Alakazam, Astor, Frontier, Ickle Pickle, Kenworthey Magic, Mikame Craft, Vernet Magic and of course TORA Magic. All of this and soooooo much more.